As we turn the page to 2014, I'd like to begin by apologizing for our light December. Big things happening on our sister site, the Green Bay Packers Uniform Database. We have a total rebranding in the works over there, and it's caused a slowdown in our production for BorchertField.com. But not to worry - we have lots of exciting things on tap for the New Year. 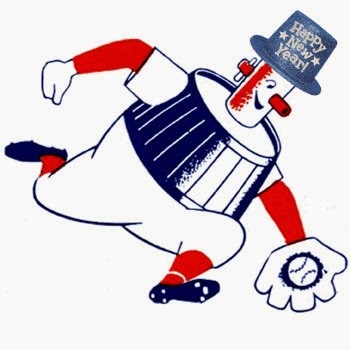 2014 is the 70th Anniversary of Casey Stengel's time at the Orchard, not to mention the Brews' fifth pennant, and second of what would become three in a row. We'll have full coverage of that amazing season, from the first pitch at the Orchard to the final inning of the playoffs. If you enjoyed our "This time in 1913" series from last summer, there'll be a lot more for you to like. This is also the 70th Anniversary of Milwaukee's short-lived entry in the All-American Girls Professional Baseball League, known variously as the "Chicks" or "Schnitts". And yes, I did suggest to the Brewers that they consider a Turn Back the Clock event to honor the team. In any case, we expect 2014 to be a very big year here at BorchertField.com, and we're honored to invite you to join us.